I've been in the IT industry for about 10 years but I have been avoiding programming for quite some time. I've heard about Michael's book from following Derek Sivers and it doesn't disappoint. The material builds up your skill set in a very methodical way. I have learned so much and I'm only half-way through the material. The material in this book has given me the confidence, that with hard work and great reference materials, I can definitely become an engaged and proficient programmer in Ruby. This book is incredibly in-depth and a great resource for anyone who is looking to get into Rails. This book helped me get the fundamental concepts of web programming and how to think like a programmer in general. The way its written allows for the concepts to become the practice as you gain experience. I love that way TDD is included in the development process, which adds another much needed skill. Thank for making another great edition. Not only the best tutorial for Rails, but also one of the best ways to become a skilled web developer! Save your time, start with Michael Hartl's material. In 90% of the time, no additional material will be needed. If so, Michael provides several links and references of the highest quality. I have studied computer science in college and we covered a little bit of Ruby on Rails. At that time it was all very confusing as the module was very short, lecturer was not interested in teaching us and he insisted on using Git that none of us used it before, so basically I lost my interest as the main programming language in my course was Java. This year I had to start using Ruby in work for data testing and I fell in love with the simplicity of the syntax and decided to try it out. After a quick google search I've found Michael Hartl's Ruby on Rails Tutorial with very good reviews so decided to try. I am only on the first chapter but I would recommend it to everyone who want to try Ruby on Rails. The book is doesn't get me bored at all which is really important to me, it is challenging enough to keep you interested but at the same time everything is very nicely explained and I already promised myself that I will complete this tutorial. Would be very interested to try out Learn Enough tutorials now! The ruby on rails tutorial was the book/website that helped me learn rails. It explains enough detail to get you through and to build your understanding. In my opinion, this is THE way to learn Ruby on Rails. Not only will you learn the Rails framework itself, you'll receive a pretty well-rounded education on the science of building web apps in general. Of particular note is Michael's emphasis on TDD (test-driven development). While many books and tutorials relegate testing to an after-thought chapter, the Ruby on Rails Tutorial gets you into the rhythm of testing from the very beginning. As you progress through the material, you'll apply TDD to build a real, functional, fully deployed app. Learning software development just doesn't get any better than this! I think I learned more from this book than I did in two web development classes in college! This book is the reason I fell in love with rails! Currently I am learning command line tutorial of Michael Hartl's and I find it very helpful, easy to learn, and I can get quick reply by Michael. Therefore I bought the Ruby on Rails lessons, which is my final aim. Being a fresh guy in IT industry, I'm satisfied to start here. If you are like me, don't know anything about IT and don't know where to start, start here. It will be worth it. I have done multiple Rails tutorials online, all of them were great for getting an app up and running but they all have left me wondering "well...I made an app, but what did I actually just do?". Not this one, I am up to Chpt. 7 in the book version and already I have a deeper understanding and better sense of clarity of how Rails works and what I am doing to make it work then before. The testing of the sample app as I make progress in this tutorial is a huge part of why I am beginning to really understand how Rails works. No other tutorial that I have done ever even mentioned testing  or Test-Driven Development. Great tutorial, thank you! When I started off learning web development on Rails I often googled for the best resources available out there to learn and be fluent in it. 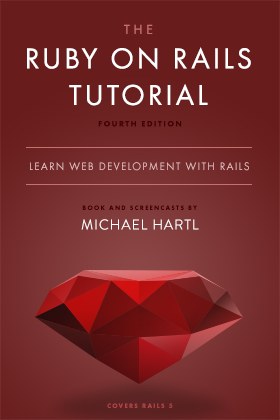 Almost all the time Michael Hartl's Ruby on Rails tutorial book showed up. It's 'The' book out there for learning Rails development. I love building applications on Rails. I love coming back to Michael Hartl's Ruby on Rails Tutorial book to be a more efficient developer. It's simply my source of confidence. I know if I get stuck in the process of building a rails app, Ruby on Rails Tutorial, I know, will help me get un-stuck. Look no further than this book to get started on rails. Michael Hartl does an excellent job explaining the basics all the way to some of the advanced topics. Ruby on rails tutorial books provided by Michael Harl are the best books you can use & read to learn about ruby on rails feature and usage. They talk about each aspect of rails and is very good book for beginners. I used this book to learn rails and it helped me so much advancing my knowledge in web development field. I have read the whole book and learned all the nuances the rails framework provides. This book helped me to build the whole website on my own. Highly recommended for beginners to experts. This is one of the most thoughtful and well organized books on the subject of web development. It has many nuggets of wisdom that go far beyond Rails or Ruby, and will serve anyone well who wants to really understand how web applications work. The Ruby On Rails Tutorial is the best way to learn ROR and the basics of web development. It takes you from the beginning and teaches you everything that you need to know. I highly recommend this book for anyone starting out in web development. A very practical tutorial, with lots of explanations. There is everything you need to get started, and to begin to understand how rails actually works. It is the perfect book to learn all the concepts of Rails, specially the MVC pattern, while developing a real web application. I've tried several tutorials to learn Rails without success. After following the Ruby on Rails Tutorial by Michael Hartl, every small pieces are getting together. Now I have more confidence of what each command is doing and how Rails works in general. Highly recommended.